According to the report below, the city council are considering abolishing the German Market this year stating the possibility that it may become ‘boring’. Possible other options to replace it according to the same report are more fairground rides (what a surprise that one is, I wonder who will be providing those?) a craft market and the English cafe market to return. Now maybe I’m alone on this but I think this is a great shame. I’ve come to enjoy my annual visits to the Old Market square for the ‘switch-on’ night and the atmosphere generally when dropping off there for a tasty Bratwurst and a German beer or two, or a Glühwein. Like any such event there are improvements that could be made and perhaps nobody is trying to state it’s the genuine article in terms of it being ‘authentic’ but it is fun, friendly and relatively safe as far as having a drink in the city centre is concerned. I’m not an overly political person these days but I sometimes think the city council seem quite unattuned to what the people of Nottingham would like to see happen in the city, certainly in this case. I often wonder how many years the ‘Wheel of Nottingham’ will be planned to return for example. One never really knows for sure but on the evidence of my own frequent passages through the square I rarely see anybody actually on it. I took a ride for a fiver on it’s first appearance and it was okay but it could be said that ‘once is enough’ for such an attraction. Sometimes they get it right. The City Pulse is a good example of that. In the case of the German Market I think they are kicking to the kerb prematurely a nice little new tradition in the city needlessly. Time will tell. I know for the suggested options so far they won’t be seeing my cash in the proximity of the council house during the coming winter. I have heard from someone in the NCC Comms team that it’s not certain that the Wheel will be back next year. Thanks for the info, Andy. I really couldn’t see how they could drag that out for a further annual stint. Kind of surprised it was back in 2010. Collins,the fairground family; Collins,the Leader of the City Council. I’m making no accusations but it makes you think doesn’t it? Interesting. There was a similar attempt to ditch the German Christmas Market in Brum a couple of years ago. It was met with general outrage and sure enough last year it was back. Apparently it’s very good. Each year at this market there has been a guy selling fantastic pottery in weird and wonderful shapes and I have bought my granny a piece each year. does anyone know who he is or how I can get hold of him? It totally ruins the xmas scene having rides on the square. We have goose fair that should be enough!! Xmas markets are more nice and helps to bring the christmas spirit for everyone. Come on get into the spirit not stupid rides!!!! Quite agree, Chris and I’m glad to find someone who feels the same way. It just doesn’t fit in with Christmas does it? No doubt there will be yet more fairground rides next week on the Forest for the council fireworks show for November the fifth too! I would hate the fact that the German Christmas Fair stopped. Why should a fairground replace it? Christmas Fairs bring in the atmosphere of Christmas. Fairgrounds do not. I am hoping that the German Fair continues with bringing two countries and cultures together. First time in 3 years i’ve been able to come up to Nottingham this year for the German Market and they have gotten rid of it?! Why? That’s the main reason I am visiting. What a shame! I hope more people complain. Kelly. I am hearing varying reports. The city council website reports that there will a ‘Victorian Market’ IIRC but others I have spoken to maintain that the German Market will yet happen. I hope it’s the latter. Whatever happens, I hope you enjoy your visit! We moved back to Nottinghamshire 7 years ago and we have been to the German christmas market ever since. For me (by the way, I am German)it’s a big reminder of “home” at Christmas. My family (husband is English) and I always enjoy the German food, the German beer and the Gluehwein, not to mention the German products you can buy. 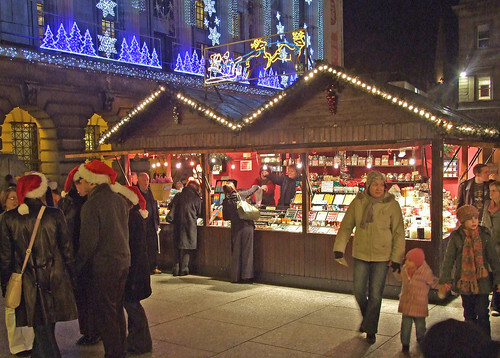 It would be a great shame if the city council would cancel the German market. If this is the case, we will have to find a German Christmas market elsewhere to spend our money. What a nice post, thank you! I’m really happy to hear that the German Market has been a little source of ‘home’ for you Beate. I echo your sentiments and am eager to see what develops. Passing through the Old Market Square today I note that the first signs of the outdoor ice rink being assembled have begun. Christmas is around the corner! a brave move by the council, which in my opinion is a big mistake. The market was great, not commercialised with rubbish or overpriced burger vans, like our own Christmas market in Lincoln has become. The atmosphere was great and made it a nice place to be, non-rushed, you could wander around at leisure not crushed by thousands, great food and drink. We’ll come to see this new delight the group have organised and comment after that. Thanks for your comments, Mark. Particularly interesting is your comparison with Lincoln’s big event. Information about this year’s event has been a little difficult to find until very recently but apparently it is to be a ‘Victorian Market’ this year, whatever that looks like. There will be an ‘Olde English Tavern’ in the square and a miniature train ride for the kids alongside the ice rink etc. It opens tomorrow evening (24th Dec) with the big lights switch on at 6.20pm. I hope you enjoy another visit to Nottingham. Just visited the ‘Victorian market’ last night and today. I’ve got to say that it’s not a patch on the German Market – kind of feels like a hodgepodge of market traders and parts of some random funfair. The beer and bratwurst stands have gone too – beer has been replaced by an ‘English Tavern’ selling drinks you can buy in any other bar in the city centre (Out goes the Weisse beer – in comes Carling). It’s sad as it takes all the class out of the square that the German Market used to bring. My family and friends used to look forward to coming to the market, and possibly finding a Christmas gift on the market. It’s sad, but combined with the state of Broadmarsh I’ll probably tell them to go to Birmingham instead. Cheers Paul. I took my first look at it yesterday afternoon and have to say I echo many of your comments. Perhaps the only improvement is that the ‘Lodge’ bar is superior in some way to previous (apart from the drinks on sale as you mention). Cosy seats to sit in an heaters make for a nice atmosphere. Guess it’s modelled generally on a Canadian-style hunting lodge or cabin. A bit hokey but fun all the same. For the rest I think they’ve made a big mistake as in the areas you have pointed out. I have friends who visit the Birmingham German Christmas Market who speak very well of it. Sounds like a good choice for a visit. Sad loss, Christmas shopping will not be the same, (wife shops, I wait at the beer stand dinking my favourite tipple, Weissen Bier) guess we’ll have to take our custom elsewhere. Sounds like Birmingham is the place to go. Nottingham Council complete Dogsh it. Typical council stupidity, tax something so much that it’s not worth the stall holders coming. Then replace it with crap?!? Bring back the Christmas spirit to Nottingham and stop ruining things.